Mission Belt Premium Gift Box Set - 35mm Basics | What Should I Say? Good things come in threes and great things come in threes wrapped in an awesome gift box. The perfect gift for anyone with pants. The box is matte black and measures 9.5" x 6.5" x 5.5" with premium foil embossing and a magnetic closure. 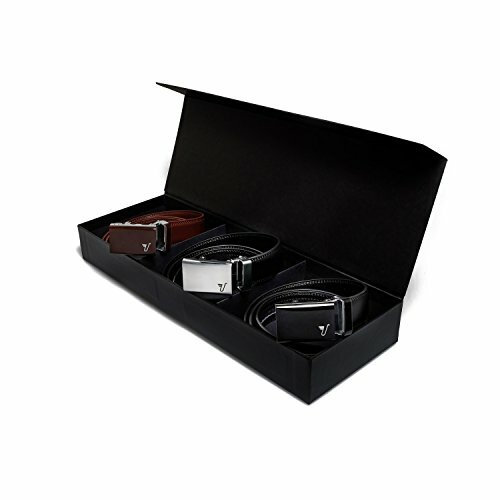 Once you receive your Premium Gift Box you can interchange the belts and buckles in the set. Bonus! You can interchange the buckles and leathers in the set. Bonus! Buy a Belt, Feed a Family - A DOLLAR from every belt goes to fight global hunger - Thanks for being a part of The Mission! If you have any questions about this product by Mission Belt, contact us by completing and submitting the form below. If you are looking for a specif part number, please include it with your message.